This is part of a sponsored campaign with [ yellow tail ]. However all opinions expressed are my own. We are disclosing this in accordance with the Federal Trade Commission Guidelines, 16 C.F.R Part 255. What an incredible week of news we’ve had in the United States. Historic. And, now with the Fourth of July holiday in a few days, the explosion of fireworks in the sky will bring home the message loud and clear – Life is too short not to sip sangria. This weekend we asked a few girlfriends to come out with us to the Hollywood Bowl to celebrate the good news for the country, celebrate friend, and celebrate the summer! 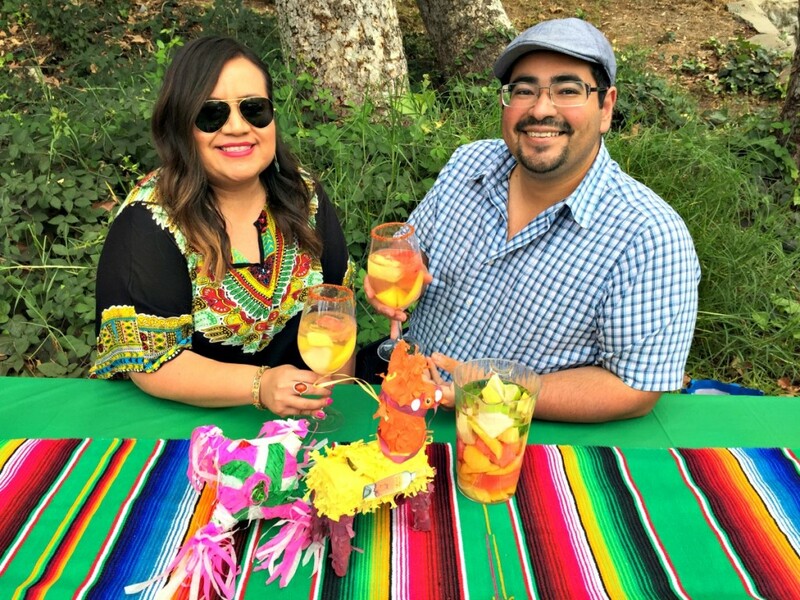 We introduced our comadres to the delicious Sangria portfolio from [ yellow tail ], which includes a red Sangria and Sangria Blanco. The Sangria Blanco is a refreshing combo of premium white wine. 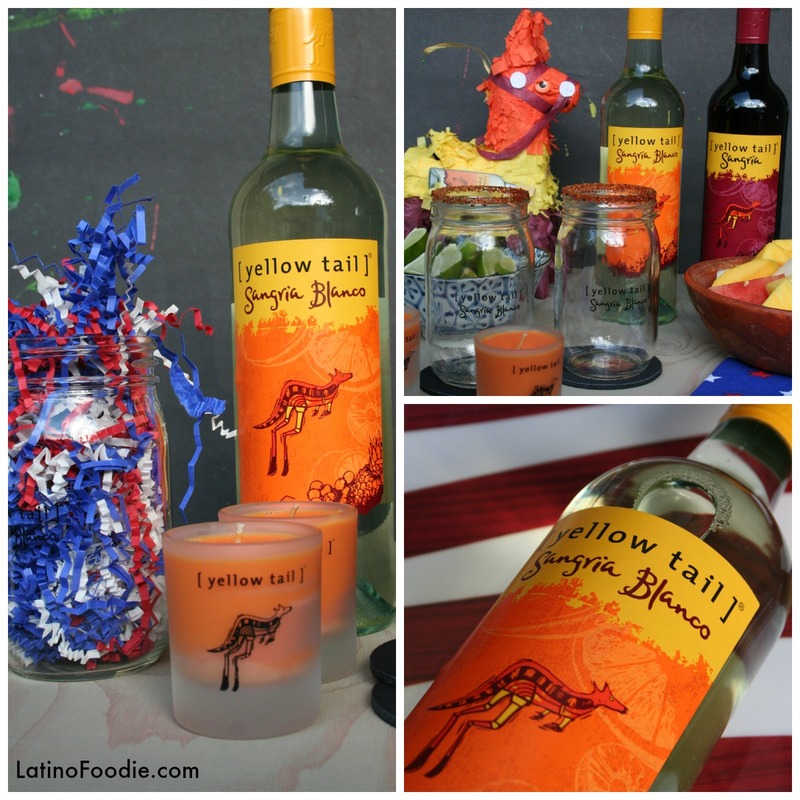 The [ yellow tail ] Sangria Blanco has tropical fruit flavors of pineapples and ripe peaches. There is a kiss of citrus, ensuring a crisp, refreshing finish. Sangria has long been regarded as a celebratory cocktail beverage savored in Spain or Portugal, especially during the hot, summer months. The popularity of the drink has made its way across to the United States — THANK GOD! On our outing with the girlfriends, we enjoyed the Sangria Blanco as it was lighter and more refreshing which are definite pre-requisites for day drinking on a hot, sweltering day in Los Angeles. We had so much fun brainstorming names for our new concoction (sangria can do that for you) and finally came up with this snappy name: Spicy Sangria Sparkler. Don’t you just love the alliteration? You ask yourself, “SPICY?” Where did you get that idea? 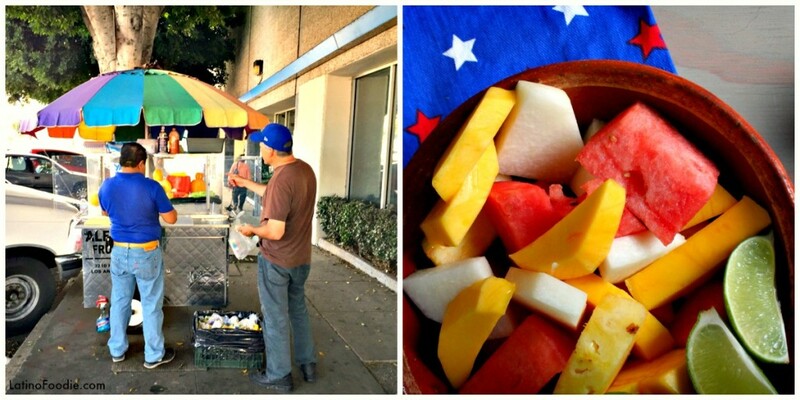 As in Mexico, we are blessed in Los Angeles to have street cart vendors with rainbow colored umbrellas chopping chunks of fresh, sweet fruits, such as watermelon, mango, jicama, oranges, grapefruit, cucumbers, and cantaloupe. What gives these fruits even more flavor is that the vendors will squeeze lime juice and sprinkle the fruit with chile powder. I’ll even add bottled hot sauce to mine! My husband and I thought to ourselves what a splendid idea to take that fruit from the street vendor as an inspiration for our Sangria Blanco recipe. Our Sangria Blanco recipe features spears of mango, jicama and watermelon in a glass rimmed with lime and chile powder. The flavor was phenomenal, especially when you allow the fruit to sit in the wine for a good 15 minutes. Actually, my favorite part of the drink is eating the fruit infused with the wine after the drink. The watermelon and jicama soaked up all the Yellow Tail Sangria goodness. In a large pitcher, combine all of the fruit and sangria. Chill for 15 minutes to a half hour (we couldn’t wait). Rim four wine glasses with lime. On a small plate add chile powder. Rim the glasses with chile powder and let sit. Back at the Hollywood Bowl with our friends, we laid out a spread of various salads. The [ yellow tail ] Sangria paired perfectly with the Tortas de Carnitas I had made for our guests. The Tortas were layered with mashed pinto beans, fork-tender carnitas, avocado, panela cheese, and rajas, a sauteed combo of poblano peppers and white onions. We also made homemade salsa. The fruit-filled white sangria was so refreshing with the spicy Mexican food. [ yellow tail ] Sangria pairs well with: BBQ meats/beef/pork (i.e. burgers, carne asada, carnitas); poultry (i.e. pollo asada, chicken teriyaki, ); seafood (i.e. grilled shrimp, camarones a la diabla) and cheese (i.e. blue cheese, sharp cheddar, panela queso). For a very limited time (through July 4 only!) [ yellow tail ] is offering a free audience giveaway! Check out my Facebook page for my details on how to win a great prize including a set of mason jars, colorful piñata, coasters and more! 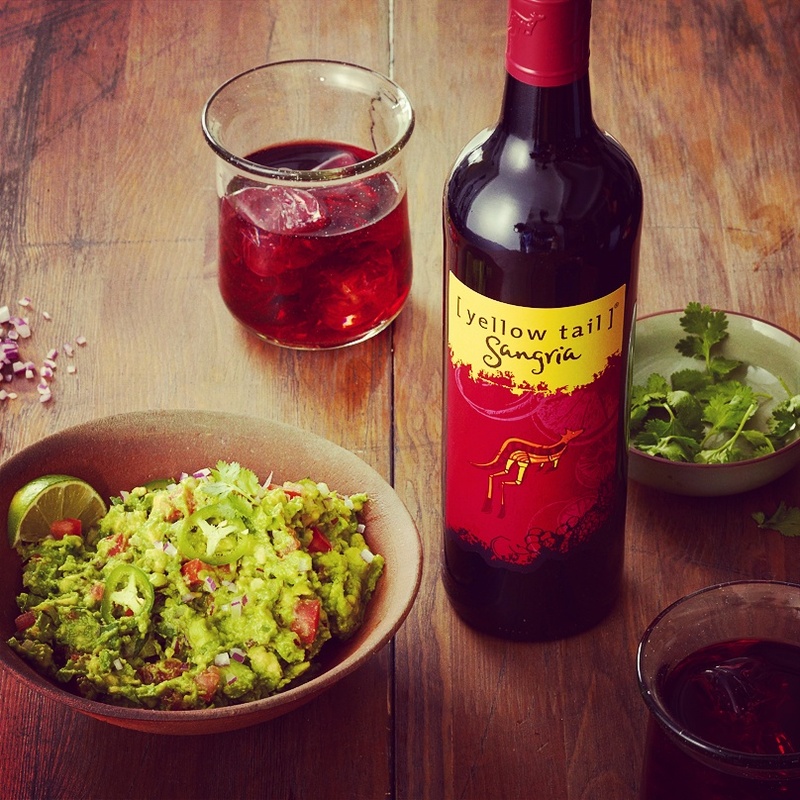 To learn more about [ yellow tail ], visit http://www.discoveryellowtail.com. 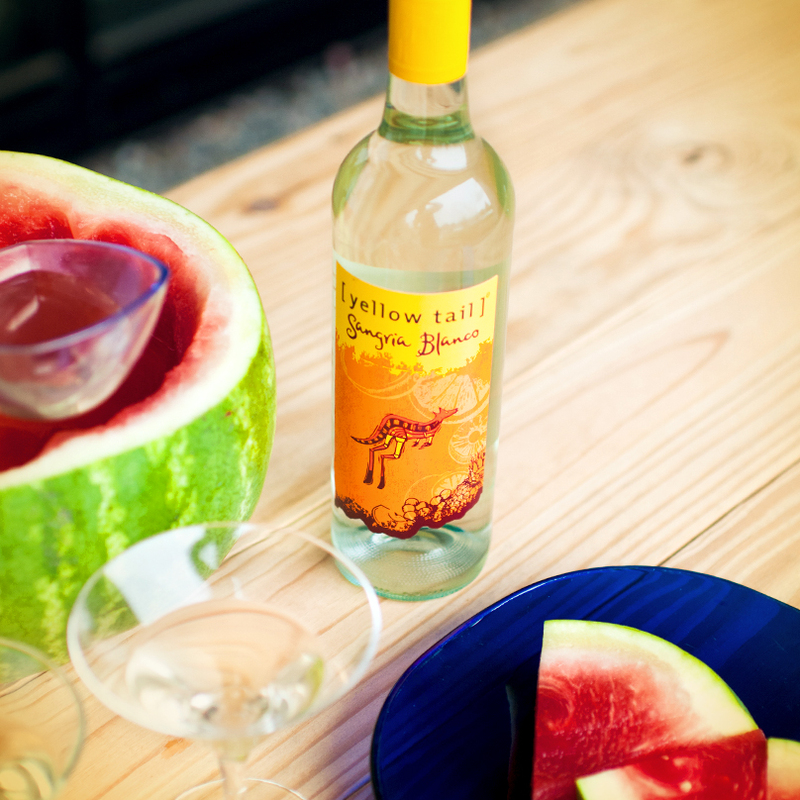 Enter to win your own “Summer Celebration with Sangria” from [ yellow tail ]. Don’t forget to leave a comment for an extra entry! It was magical! How do you drink your sangria Angel? Frozen fruit works much better than ice cubes, specially when carrying around a bottle for a Hollywood Bowl picnic! Cheese and crackers are also a must have! Always love seeing the new recipes you come up with!!! Love that you both went to the fruit cart for the fresh fruit! I’m definitely going to do the same. We enjoy Yellow Tail very much. We can’t wait to try the sangria sounds refreshing. I’m pretty fond of fresh mango in sangria! Great ideas and proof that it pairs well! Enjoyed! I always add a couple shots of Tequila to pitcher first then add sugar to make simple syrup before adding apples, oranges and grapes. Yahoo! Thanks for having the contest, and I am so delighted to win! Can’t wait to figure out what I will pair with the [yellow tail] sangria! And I’m definitely drinking it out of those cute jars!